Crucible is a dour, depressing place. 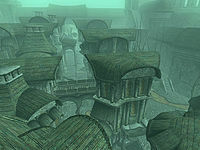 Crucible is the southern part of New Sheoth; located in the Dementia half of the Shivering Isles. This murky area of town has a lot of rundown houses and many of its residents are depressed and paranoid. It is guarded by the Dark Seducers and ruled by Syl, the Duchess of Dementia. The New Sheoth Graveyard lies to the southwest of Crucible. The district comprises a central thoroughfare that runs from the main gate to the gate to Bliss and consists of all of Crucible's shops and houses. Various alleys weave between the buildings, leading to the open sewers that run along Crucible's walls and serve as home to the distict's homeless residents. Above Sickly Bernice's Taphouse is a large rooftop terrace where the Duelists convene for matches between 8pm and 10pm. Adjacent to the gate are stairways leading to the Sacellum Arden-Sul and New Sheoth Palace. Also based in Crucible is the Museum of Oddities whose curator is soliciting donations of "odd" artifacts to put on display. Crucible is built upon a steep hill, so caution is advised to avoid the multiple sheer drops around the district. "Accidents" involving citizens falling from the drops are said to be a regular occurrence in Crucible. For those proficient in Acrobatics, many treasures can be found on Crucible's rooftops including a Sunken Urn Key that unlocks an urn in the sewer behind Sickly Bernice's Taphouse. Flora native to Dementia can be found growing throughout the district, particularly around the sewers. Along with Bliss, Crucible does not have its own jail. Criminals who are arrested in the district are instead sent to Corpserot Prison, located south of The Fringe. If your Acrobatics skill is high enough, try exploring the rooftops in Crucible. 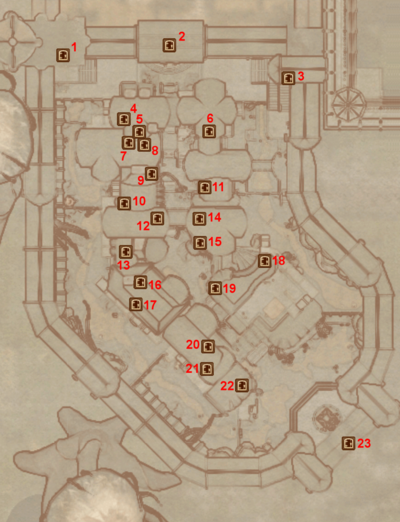 You may find some interesting things, including a guaranteed magic item (a Ring of Light) and the start of an unmarked quest. 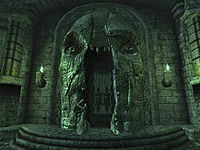 The Ring of Light is located on the roof of Ma'zaddha's house, next to a pair of fur gauntlets and two bones. This page was last modified on 27 August 2018, at 08:18.